This week we are celebrating the Month of the Military Child with several exciting events! On Friday we will have a special Friday Flagpole Assembly with a VIP guest speaker; please join us! On Friday afternoon before release at the end of the day, all students will be treated to pizza courtesy of our Military Liaison program. Friday is Transitional Kindergarten Bring a Family Member to Lunch Day! Please check in at the office by 11:30 to join your child. This week’s theme is RESILIENCE: Silver Strand students, especially those who are military dependents, have demonstrated resilience through transitions related to moves and deployments. But all of us have opportunities to practice skills of resilience when we face challenges. Resilience means identifying emotions which arise and practicing strategies to manage them, as well as using coping strategies to get through stressful situations. San Diego's warmer climate makes it a more welcoming region for lice infestation among children and we want to remind our Voyager families to check your students' heads regularly. Do not panic if you have lice in your family! A regular regimen of treatment and frequent checks will eradicate lice and prevent future outbreaks. Lice are not a sign of poor hygiene! Wearing hair up or combed in ponytails/braids and with hair gel help prevent spread of lice. Live lice look like small tan insects and are most commonly found on the scalp at the crown of the head, around the ears, and at the back hairline. Combing with a fine-toothed lice comb will remove most live lice and is a critical step of treatment. Eggs/nits look like tiny grey/white pods attached to the hair shaft close to the scalp. A faithful treatment regimen every seven-nine days for a three-four weeks will disrupt the reproductive cycle by eradicating live lice and new egg hatchings. If you have questions about lice, feel free to email our Health Technician at Frankie.Guillen@coronadousd.net. Hi students! Want to put your ART skills to use & design a school safety poster to hang in Strand Hall? If yes, then please follow the directions below! Each day, we practice LOTS of different ways at school to be SAFE! This poster is to showcase those SAFETY actions. Please put first & last name as well as grade level on the poster. *OR, any other area you can think of! Students may use any media: marker, ink, paint, crayon, photographs, etc. The more colorful, the better! Please label what safety action is happening in your picture, and, be sure all spelling is correct! Posters are due to the front office BY Thurs, April 18th. They will be displayed in Strand Hall windows facing the flagpole. HAVE FUN! Each student who makes a poster will receive a certificate & small treat! 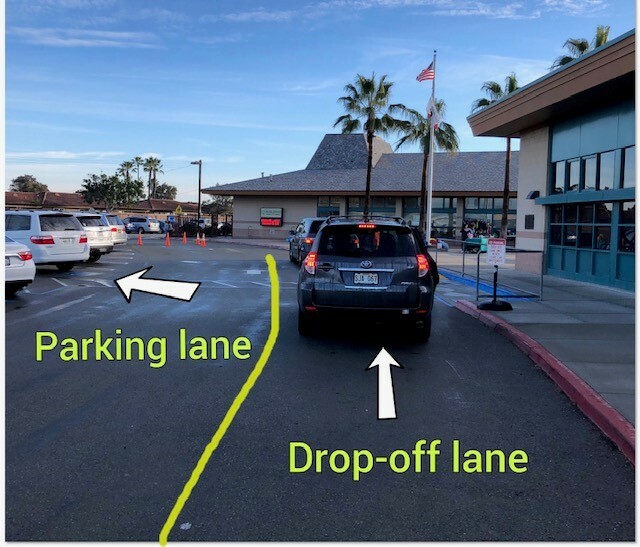 Please use the far right near the curb to drop off and pick up (do not leave your car). The left side is for parking--please avoid passing along this side unless directed by staff to do so. 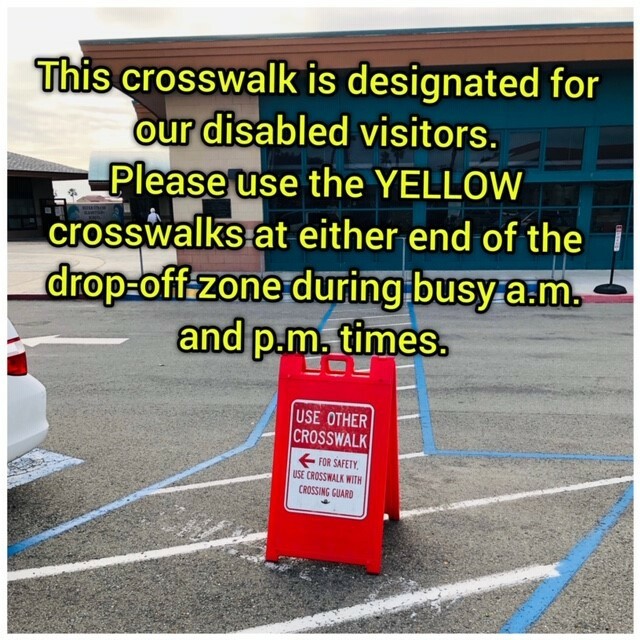 The cross walk in the middle of our drop-off and pick-up zone is reserved for visitors and families with individuals with disabilities. 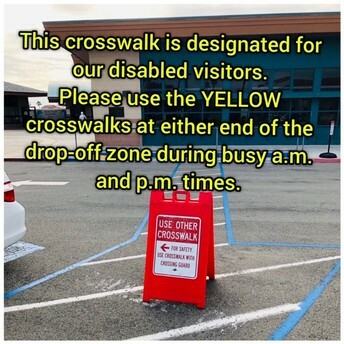 When parking or walking with students to school, please use the crosswalk adjacent to Strand Hall/campus. We are looking forward to recognizing Month of the Military Child! During the week of April 8, we will have special dress days and a Friday Flagpole celebration. The next PTO meeting is this Thursday at 8:30 AM in the Library! ALOHA!....LUAU is coming at the end of the month! Please make sure your luau contributions are to our luau basket parent soon. This will ensure enough time to put the baskets together. Preorders for food are due at the end of this week, and prices go up and supplies are limited on the night of the event! 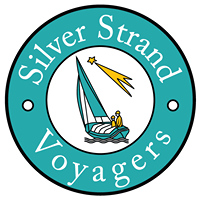 Thank you to our Silver Strand Voyager parent community for stepping forward to assume roles on the PTO Board! Our school is enriched through our PTO's activities for students and families and donations to our programs. Thank you for your generosity! Thank you so much, Voyager Families! Your generous contributions during the CSF Telethon earned us the Mootime Ice Cream Party! Thank you for supporting our Specials Programs, Academic Support and Enrichment, and Band and Choir! We appreciate you! A special thank you to Renee Cavanaugh, Eric Bachman, our TK/Kindergarten and Specials teams, and all our staff, students, and families who supported the CSF Telethon through performances and donations! Voyager Yearbook: Last chance to purchase! Thank you to our parent volunteers who put our yearbook together! THIS WEEK: MONTH OF MILITARY CHILD SPIRIT WEEK! Coronado SAFE supports healthy families and children through workshops/"coffee talks," school programs, speakers, and counseling. This presentation will have a brief overview of what students learned at the 6th grade Drug Store Program, however, it will primarily focus on how to talk to your kids about drugs. See https://coronadosafe.org/ for more information and to register for upcoming events. Silver Strand Elementary School is SO fortunate to have the full-time services of our very own MFLC (Military Family Life Counselor), Gia Del George! Our MFLC is available to help students through the emotions and transitions associated with military life. If your family is facing separation due to deployment, or any transitions or challenges, please contact Ms. Gia at MFLC.Strand@coronadousd.net. For information about military-sponsored activities for youth, visit the Fleet and Family Services website here. Stay Connected with Silver Strand Elementary School!! We want you to be "in the know"! Read our weekly email, and please check our website to stay up to date on school news, programs, and upcoming events. There is a "Search and Popular Pages" tab on the middle righthand side of our Home Page. This contains Voyager Family Emails, PTO link, Menu, Calendar and other important information. There is also an orange PeachJar tab on the bottom right of the Home Page. PeachJar contains flyers for Enrichment Clubs and other organizations hosting events at our school and in the community. The link to our homepage is: https://strand.coronadousd.net/.